“Thunder, Thunder, Thundercats Hoooooooo!” I actually found one of these just laying in some bushes one day. It was the day of a party at my Grandmother’s house and my friend Stuart and I found this along with some other awesome toys just sort of stashed in some bushes. We spent an hour or so clashing with the sword and guns and pretending we were the Thundercats, sight beyond sight and all that. I was Panthro, by the way. My little sister, Mumm-Ra of course. It wasn’t long before we were beset upon by the Mutant kids who had stashed these toys in the bushes in some form of extra Chromosome safekeeping. After some stone throwing and G-Rated cursing, we were forced to give back “MOST” of the toys. As far as I know, Stuart can still summon the Thundercats when he needs them. “Sight Beyond Sight” indeed. The Thundercats were a cultural watershed for the Under 12 Furry set, anthropomorphic Cats and supernatural monsters are always a great draw. Especially if they have both Tanks and Swords. Not to mention hoverboards, nunchucks and a cat/rat thing that has an easily imitatable vocal tic, snarf. The Sword of Omens toy itself was not anything special, certainly no better construction than any other toy sword, but it had the Added Bonus feature of the Eye of Thundara, something your “Flash Sword” or “Pirate Sabre” simply did not have. It could break just as easily, but you could look through the hilt and claim to see the approach of your enemies for as far as 3 blocks away, if you were on an open field or a long straight street. 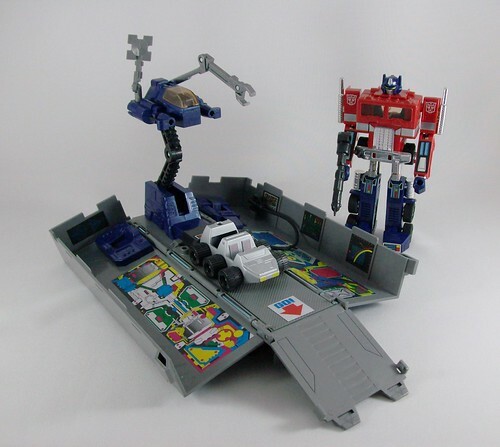 Leader of the AutoBots, Easy to transform, comes with a trailer that contains a “repair droid” and a car with human sized seats for some reason. You fold the head and fists into the chest, there is no “Prime Matrix” in there in the G1 version. Optimus Prime was also the only one of the first wave that really looked great in both his “Robot” and “Vehicle” forms. He was heavy and made with a bunch of die-cast metal, so parents could feel like they had value for their money when it came out of the box. I had read the initial issues of Transformers as a British comic (Large format, newsprint styled comics) and it contained a bit more about the Transformers and some statistical information about the ‘Bots and what they could do, I don’t think there was a toy that I wanted more the year that Optimus Came out. I may have promised the soul of my little sister to Satan that year, who knew that stuff worked? The big day came, I put the stickers on incorrectly and Optimus Prime spent the next few years fighting Gi-Joes and At-Ats. When I sold him, it was kind of bittersweet, I’ve even purchased the reissue and sold that too. How’s that servitude to Satan working out Kerry? When you saw these walking Tank/Troop carriers stalking towards the Rebels in “Empire” you probably wet yourself with glee, I mean, there was already a “Death Star” toy, why not an AT AT. 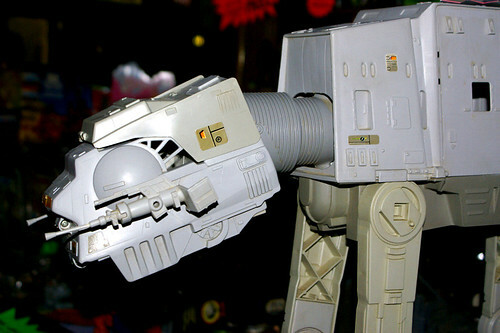 It’s a lethal Robot Dog with (on the original toy) moving light-up lasers and a head you could control like a puppet. Never mind the fact that it could hold so many figures. I had one of these, no murder required. I think I got it for my Birthday the same year I got Optimus Prime. I remember that it came in one of those semi-generic white boxes from Sears. I eventually traded it for Dolza and 12 dollars cash. Before I let it go to the crazy kid down the street, who promptly tossed it down a flight of stairs (which his mom, dad and brother told me about, then blamed me for giving it to him) it used to stalk around my bedroom, mopping up hordes of Cobra Troops and stomping on Go Bots. 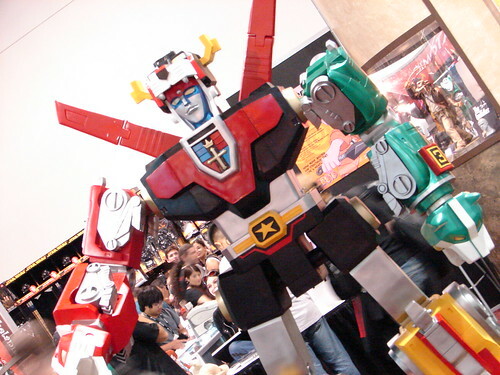 The 5 lions Voltron, as opposed to the Vehicles Voltron was a prized toy. It was 5 awesome robot lions that turned into an even more awesome sword wielding robot. It had it’s own cartoon and catchy music. The “small” toy even had friction wheels on the lions so that could “soar” across the linoleum in your kitchen. I never knew a single person who had all five of the full-size Voltron Lions. I had a bunch of the figures and Ro-Beasts, but only the “small” voltron robot. It was die cast and pretty much the heaviest toy tobot I even owned, save the japanese ones I snagged here and there (and Unicron, of course). When the Transformers Movie came out, I think everyone thought that the Unicron Toy would be out “soon” it migt be some kind “Figure” instead of a robot, but surely it wouldn’t be 20 years until we saw it, right? I think only Omega Supreme was larger than Unicron in the end. Unicron is one of the Transformers that looked SO good in his robot form I NEVER transformed it back into a planet after the first time. Why bother, Unicron stood on my desk and looked menacing, almost fully posable and with articulated fingers, Unicron was literally the greatest Tranformer ever. 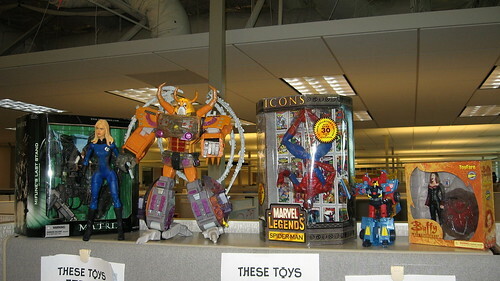 It’s too bad the Unicron Toy came out 20 years way too late, I might not have sold him when I moved back to Canada. Centurions aka (More Toys than you can buy): Centurions might have been the greatest toys ever if it wasn’t for their sheer number and cost. Robotech/Macross Toys: Transforming Robot Jets, massive alien battle pods, miniature SDF1. Silly stuff. Laser Tag / Photon: I was a photon kid, they had a better fictional universe, was there ever a photon cartoon?